AFtalks is a series of chats conducted on Twitter where we discuss building and selling apps. We’ve got a different topic/expert every week, and everyone is welcome to join the conversation. 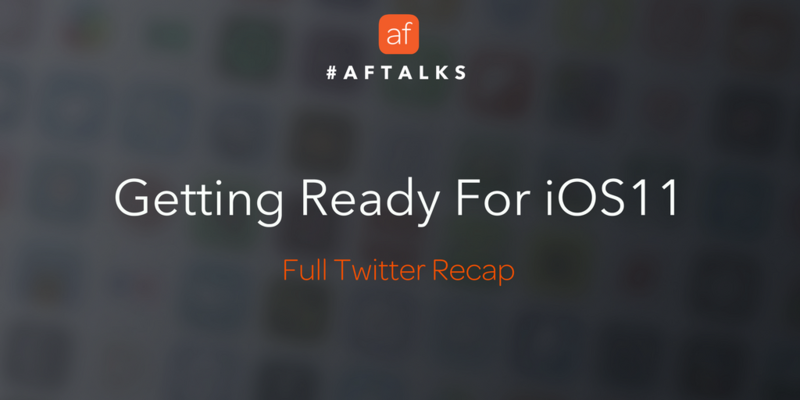 Welcome to this week’s #AFtalks recap! This week we talked about what iOS 11 means for app developers. To make sure our developer community is prepped for the upcoming improvements to the platform and the App Store, we dove into the various aspects that could affect developers and their apps. Q1: How do you think the new App Store redesign will help with discovery? A: I really like that Apple’s focusing on the “stagnation” issue with the new “Today” tab. Hopefully it gives exposure to many more apps. I’m also happy to see that “Games” is getting its own tab. It should improve discoverability, since games dominate the charts. Finally, the product pages will help. From the layout, to subtitles, more previews, etc. Discoverability is important at the app level, too. Q2: How would you approach iOS11 – fixes then features, or everything at once? A: It depends on if it’s a new or existing app. New apps can more easily focus on new features. Existing apps need to work on day one. For existing apps, once everything looks good, I’d find a new iOS 11 feature to include. Apple loves this approach. Users appreciate it. Q3: In the new App Store ratings will no longer be reset with every version update – how do you think that’ll change the update frequency of apps? A: Obviously this change could influence developers to push more updates. I imagine Apple discussed that internally. My hope though is that developers don’t use that policy change to impact their roadmap strategy. Instead, simply use it as a nice marketing tool. I'm already updating more frequently in anticipation of this. It's a huge relief. Totally. Reviews reset was today's Paid Upgrade. Update required enough impact to restore ratings quickly. Not anymore. So thankful. Q4: Which new APIs in iOS11 are you most excited about, and why? A: Core ML because its Apple’s take on machine learning, which is currently device-focused. I’m curious to see what can be done and its limits. To that end, we recently looked into Core ML to see if it could do “hot dog detection”. Q5: ARKit has been making news since its reveal. Would you recommend that developers “jump” on it, or do you think it’s a fad? A: I never see new technology as a fad but that doesn’t mean to “jump on it” either. It really depends on if it can benefit users & the market. 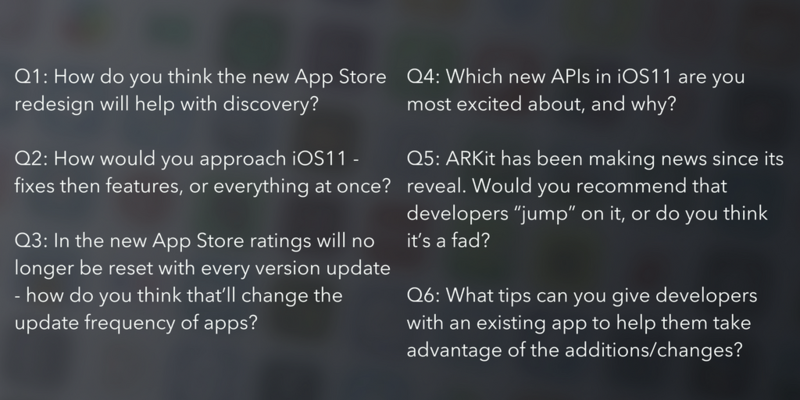 Q6: What tips can you give developers with an existing app to help them take advantage of the additions/changes? A: We are still digging into iOS 11 but I did a rundown of what was of particular interest at in our blog. This list should help developers identify some of the bigger iOS 11 updates and assess what makes sense for their app(s). Check out the rest of the insights we heard today on the #AFtalks hashtag! A huge thanks to Ken Yarmosh and to all those that were part of today’s discussion! Join us for our weekly Twitter chat every Tuesday at 1pm ET (and bring your friends!). See you all next week where #AFtalks about App Design.